MashButtons: Battlefield Heroes Beta Key Received And Activated! Battlefield Heroes Beta Key Received And Activated! So I checked my e-mail today after work and what did I see? It was my Beta key for the Team Fortress looking shooter from EA Dice, Battlefield Heroes! 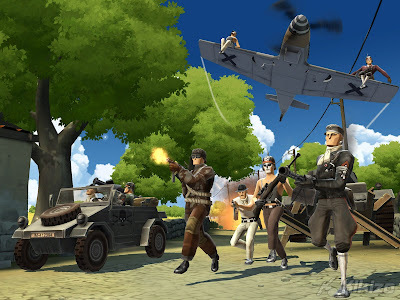 EA Dice has created Battlefield Heroes, which is a first person shooter with cartoon style...and free to play! From the first fifteen minutes after I had gotten the Beta downloaded, I was able to customize my character to my likings, and get some practice with the controls. I did not get into a multiplayer game, but while I was waiting for the multiplayer session I got an entertaining tutorial showing me controls, along with familiarizing myself with the vehicles available. Now it is time to get online to see how this toon war fps really is, and hopefully it will be open to all shortly.